Well, Google didn't just unveil a new version of their mobile OS early this morning. They also unveiled their next Google phone, a new galaxy by the name of Nexus. And just a glance on that Super AMOLED screen in 720p HD resolution is enough to tell you it means business. Now, though, with the unveiling of the Galaxy Nexus Google steps out from the Nexus S shoes of mediocrity and skyrockets their new baby into a galaxy of its own with dual thrust. A galaxy where the latest Nexus shines the brightest with its groundbreaking HD Super AMOLED display, waiting for the other Droids to follow its path. We got our hands on Google's latest Nexus device and we are going to get on board, ready to explore the unfathomed nebulas of its hardware, as well as the Ice Cream Sandwich which its using for fuel. Yummy. Putting our appetite aside though, the Galaxy Nexus is pushing all the right smartphone buttons for a 2011-2012 device. Starting from its slightly curved Super AMOLED display, moving through the powerhouse residing under the hood and finishing off with the brand new Ice Cream Sandwich, the Galaxy Nexus is certainly in a league with the best out there. 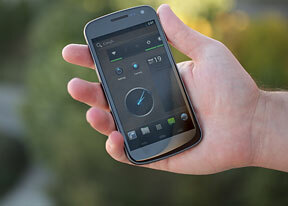 Now the Galaxy Nexus may not wow everybody with its specs sheet, it only tells half the story. There's more to it and we're just beginning to unwrap this beauty. Now, follow us as we go exploring the hardware side of the Galaxy Nexus. Android is still having fragmentation issues... Why? Low-end phones will still have Gingerbread! Apps that were not meant to optimize for every resolution/CPU/GPU. If Jelly Bean is suppose to release this year, they are SCREWED.